"He was vain, indiscreet, and opinionated. 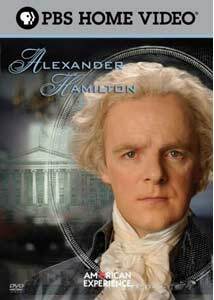 These things must be told, to give a full measure of his character..."
Though not the best remembered of the founders, Alexander Hamilton's story plays well to the American folklore, and his place in the birth of the American "story" is the focus of this film in the PBS American Experience series. Born on the Caribbean island of Nevis, legally illegitimate (his mother had been divorced), abandoned by his father, his early prospects were not good. After his mother's death, a half-brother showed up just long enough to claim all of her belongings, leaving young Alexander orphaned, penniless, and geographically distant from any important political power. Given all of that, the fact that he shows up in the history books at all is extraordinary, but his gift for numbers, good looks, and charisma are noticed in the small community when he takes a job with a trading company. It's not long before he is practically running the place, and the local citizens take up a collection in order that he might procure a formal education in New York. By the age of twenty, he's joined the colonial military, and within a few years after that he's one of General Washington's most trusted aides. He was, in his life, vain, adulterous, and disloyal to his friends, but also brilliant and profoundly influential. As biographer Ron Chernow states early in the film, "The story of the life of Alexander Hamilton is a story that the most gifted novelist could not have invented. To much of it would seem implausible�" The legendary duel that ended his life, with a U.S. Vice President, no less (and, full disclosure, ancestor of mine), was only the capstone on a dramatic half-century as the most important advocates of the Constitution and the nation's first Treasury Secretary. George Washington may get all the respect, but Hamilton's life story has lots more juice. The facts of his birth would inspire him to rise above his social status, but would also inspire in him a life-long insecurity and an obsession with personal honor. The attributes that would lead to his rise are side-by-side in his biography with the seeds of his untimely death. The quality and production values of the documentaries presented in the American Experience series, of which this is included, are generally beyond reproach. Hamilton is no exception, though it isn't quite a stand-out in that esteemed crowd. The same series recently debuted the acclaimed Jonestown: Life and Death of Peoples Temple more recently, and this more traditional bio is bound to suffer by comparison. The film moves more-or-less chronologically through the life of Hamilton using actors and small-scale recreations to tell the tale. Nevertheless, there are two things that Hamilton does brilliantly, and they're not to be discounted: first, director Muffie Meyer plants the oft-ignored Hamilton's life firmly within the context of the American mythology and all of the truth and mythology that attends that heady narrative. The life of this (almost) immigrant who rose from (almost literally) nothing to become one of the most powerful men in America could be transplanted to almost any era in the country's history and still be relevant, and inspirational. Even his downfall, which seems inevitable in retrospect, came about through a uniquely American combination of pride, misplaced honor, and pig-headedness. A duel that most likely could have been avoided with a few conciliatory words ended the life of one of the nation's preeminent founders and keenest minds when he was not yet 50. That insecurity, and sense of being a new kid on a very old block with too much to prove to ever back down is also a part of that same American story. The second thing that the film does quite well is its creating believable portraits of the main characters through the skills of the actors involved. The format of this type of documentaries is intrinsically awkward. In Alexander Hamilton, actors read letters and surviving documents directly into the camera, as though speaking to us from out of our own history. This material is decidedly non-conversational, and was never intended to be, so it makes for stilted reading. The actors, however, including Br�an O'Byrne as Hamilton, pull it off rather well, considering. As an acting challenge, it's exceptionally tricky to give this type of time-worn material life, and to let it breathe off of the printed page for which it was all intended. This film pulls it off as well as I've ever seen, and if Hamilton is conventional in some ways, it comes alive in the brief moments when it feels as though Hamilton, in all his petulance and brilliance, is speaking to us. Image Transfer Review: The image transfer here leaves much to be desired. The film looks a bit muddy and washed-out, and there's a general inconsistency in the quality. While much of it looks rather nice, there are moments scattered throughout where the different source material comes through with vastly different quality. There's some noticeable grain in these scenes, and at least the appearance of a good deal of age. It doesn't really hurt the documentary as a whole, but it doesn't help. Audio Transfer Review: As compared to the image quality, the audio is rather well-done. It's a no-frills stereo track, but it's rich and clear throughout. Extras Review: It's pleasantly surprising to find any extras on a single-disc PBS documentary, and what's here is worthwhile if slight. At roughly five minutes, the Behind the Scenes featurette isn't particularly illuminating, but it does introduce us to the director and principal actors. The rear-projection special effects involved in shooting the drawing room soliloquies was of interest. There are also five Deleted Scenes, viewable individually. These are all brief, but provide extra background rather than merely being expansions of scenes in the film proper. History buffs will probably want to check them out. Conventional in many ways, this entry in PBS' American Experience series manages to set itself apart largely in bringing to life the words of founder Alexander Hamilton and his contemporaries through astute directing and some fine acting. The video transfer certainly leaves something to be desired, but history buffs shouldn't come away disappointed.